Would you buy a religious shrine from the very people who’ve persecuted that religion for over 1/2 a century? Well, this is exactly what the Chinese want you to do! As you can see by the amount of dirt on this shrine, it has either been in storage for a long time, or it was taken directly from someone’s grave. Not everyone in Tibet historically received a sky burial with vultures who ate their remains- many of the well to do were buried in tombs and well regarded monks buried in stupas, but everyone today in Tibet receives a sky burial with vultures through Ebay and the Chinese sellers who stole their material remains. Green Tara (Samaya Tara Yogini) is also called (Syamatara) known as the Buddha of enlightened activity, and is a specific form of Tara. 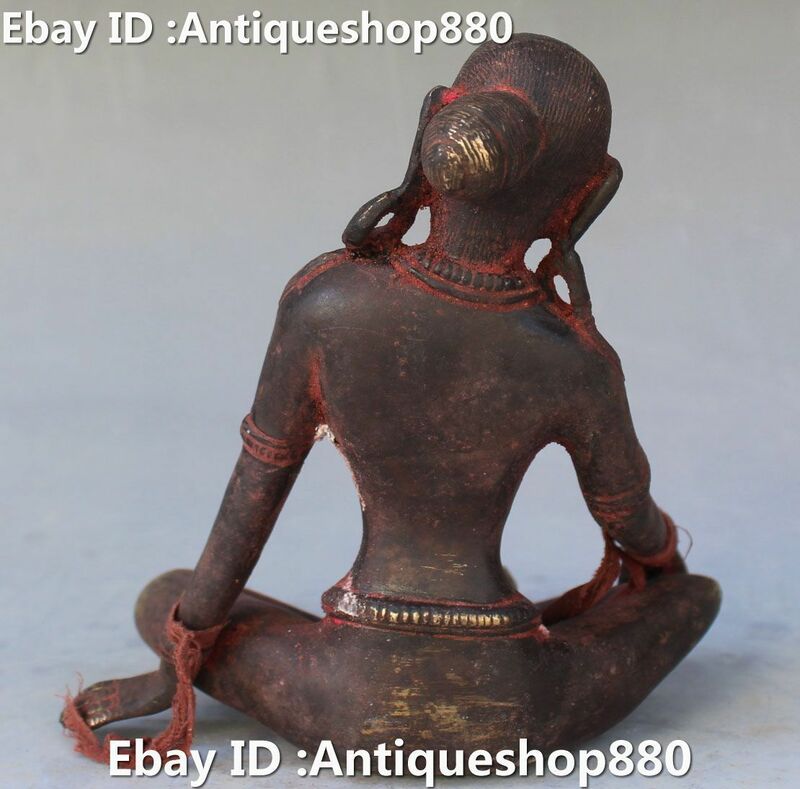 Tara itself may have originated as a Buddhist or Hindu goddess, and may have originally been a form of the goddess Durga found in ancient Hindu literature. 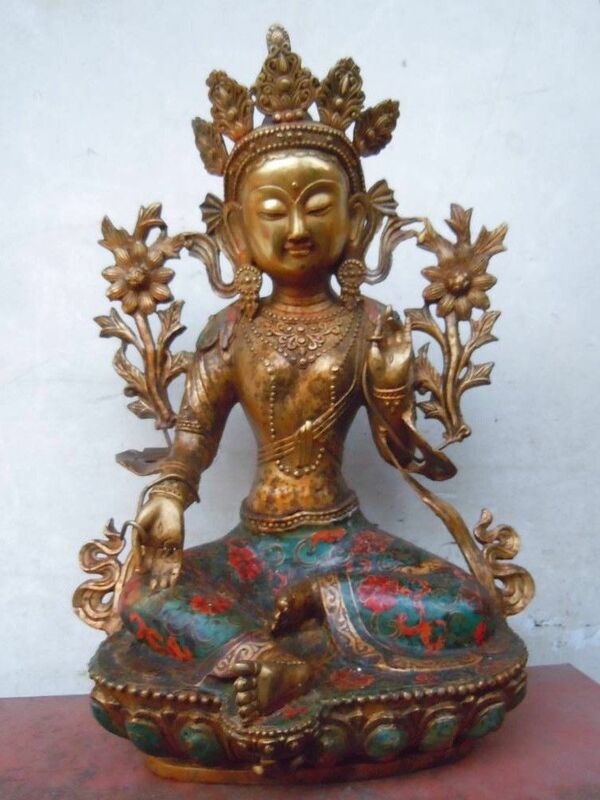 Today, she is worshiped both in Buddhism and in Shaktism as one of the ten Mahavidyas, and was introduced to Tibet through Padmasambhava in the 8th century, and the worship and practices of Tara became incorporated into Tibetan Buddhism as well. She eventually came to be considered the “Mother of all Buddhas,” referring to the enlightened wisdom of the Buddhas, and becoming a type of Mother Goddess. Tara has 21 major forms, each of which has a different color and spiritual attribute. 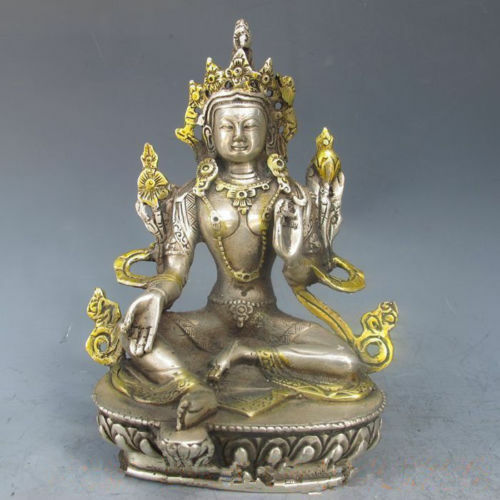 Two forms are particularly important among the Tibetan people, White Tara, who is associated with compassion and long life, and Green Tara, who is associated with enlightened activity and abundance. 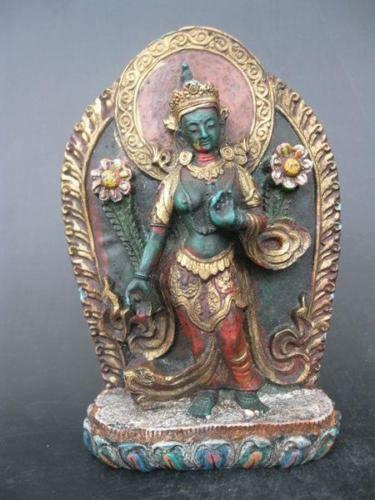 Green Tara is most easily recognized from other Tara’s by her right leg that is outstretched, ready to spring into action. 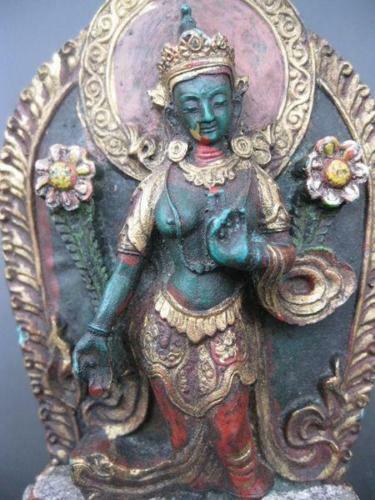 Green Tara’s left hand is in the refuge-granting mudra (gesture); her right hand makes the boon-granting/giving gesture. In her hands she also holds closed blue lotuses, which symbolize purity and power. 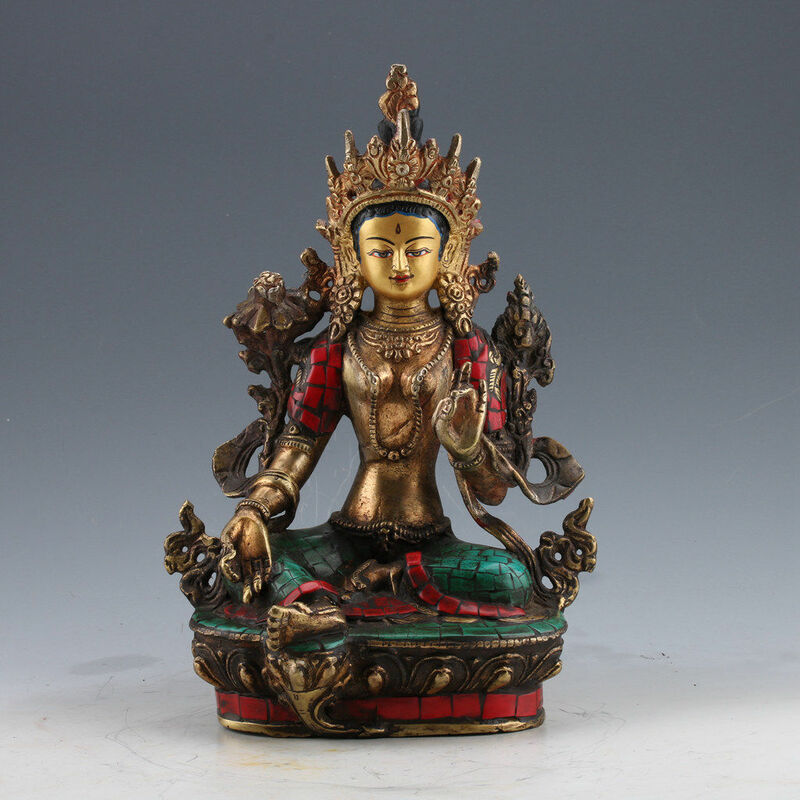 Tibetans love to pray and recite mantras, and the Green Tara mantra is one of the main three or four mantras that we say to help themselves and others. Om mani padme hum and om muni muni maha muniye soha are two other very popular mantras. Ordinary Tibetans pray to her when sick, leaving for a long journey, or when hoping for success or wealth. On a deeper level, it is also asking to be liberated from the misery of the mental delusions and negative emotions that blind people to true freedom, and to achieve the same enlightened body, speech and mind that Tara represents, not only for their own benefit, but for the benefit of all sentient beings. 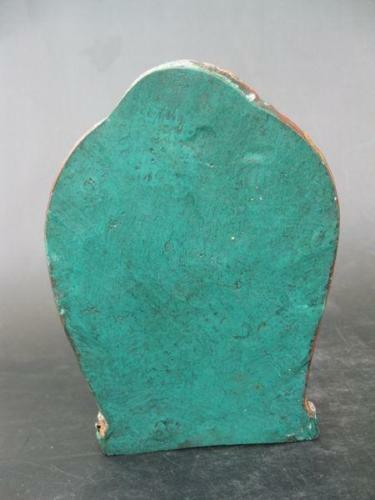 Resin statue above- faux turquoise- and the statue below is glass- faux crystal, both are painted. Though they certainly aren’t going to be the centerpiece of any museum, in the numbers that they are being sold in, again and again by the same sellers- without one single Tibetan ever involved- only Chinese who all use the same photos- are highly suspicious considering most people in Tibet are known to have had all their things taken by Chinese soldiers at least once if not twice. Where else would they all have came from? 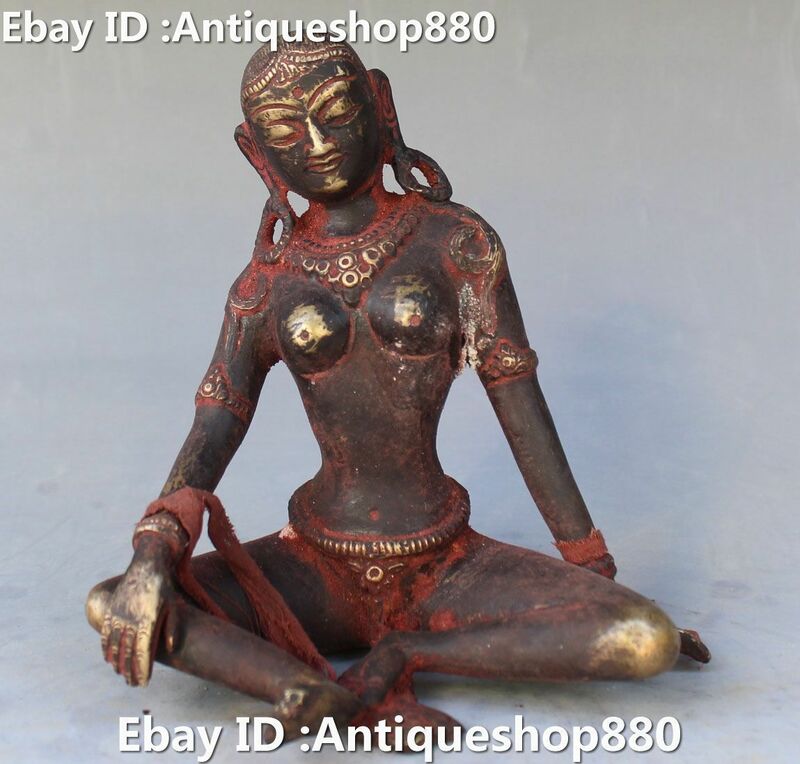 Not sure why Green Tara here looks so wrathful (perhaps this is not Green Tara? ), but many Tibetan Buddhist deities as well as founders have this look in their eyes. The hands appear ready to clap unlike other Green Taras. These statues of Chenrenzig are simpler and look more Nepalese or perhaps ever Naga and Indian influenced than Chinese and probably came from locations closer to those borders. The statue above is still covered in a red powder made from tumeric called kumkum powder which used extensively in India to honor goddesses. 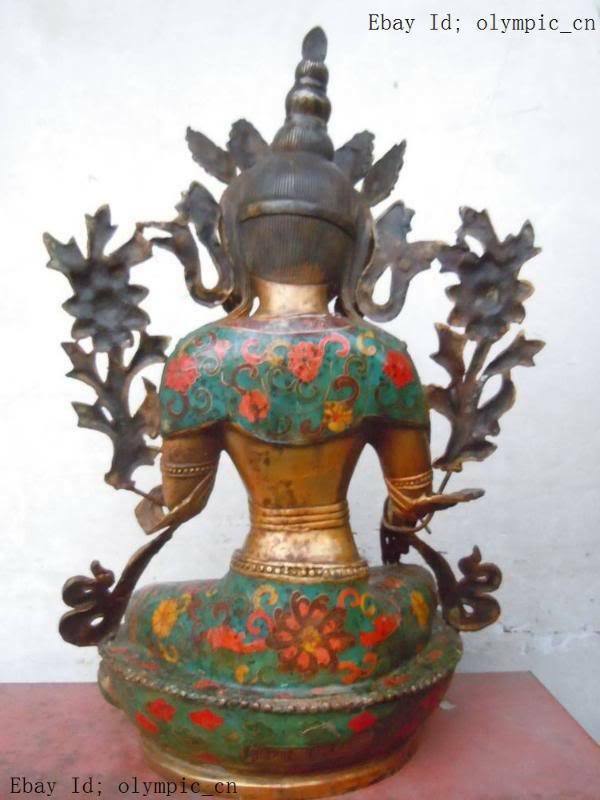 At 60 to 61 inches tall and 187 pounds (85kg), this clearly was not owned by an individual, but taken from a monastery (or two or three) in Tibet. Though it is nice to see that not everything was destroyed, it is deeply disturbing to see that “to the victor goes the spoils”. Amazing how such widespread looting of an entire country’s wealth can occur even today (yes this is probably the only things of value Tibetans even had- mainly beads and shrines) without anyone ever even questioning it. Not one single one of these statues is being shipped from Tibet or is owned currently by Tibetans. It is pretty clear that since there are more than one of these statues being sold using the exact same building in the background, this isn’t just some random Chinese family who just happened to pay Tibetans thousands and thousands of dollars for priceless shrines (neither one likely to occur in reality- the buying since communist Chinese don’t personally have that kind of money to pay Tibetans particularly in the numbers of very expensive shrines- many quite ancient and pure gold- that we are talking about in these shops, nor the selling of since the Tibetans are more than likely wanting to keep such things around instead of selling them), but something far more insidious. Like looting an entire country for everything that isn’t nailed down and probably saying it was for their own good, for what better way to assimilate people than to take away their religious beliefs, and taking away the physical parts of that religion is one method of doing so. But instead of just taking people’s things and burning them or destroying them, the Chinese sell their stuff and make millions (billions?) off it. Win-win I believe that is called in their book. They get rid of what they don’t want and get more of what they do want. 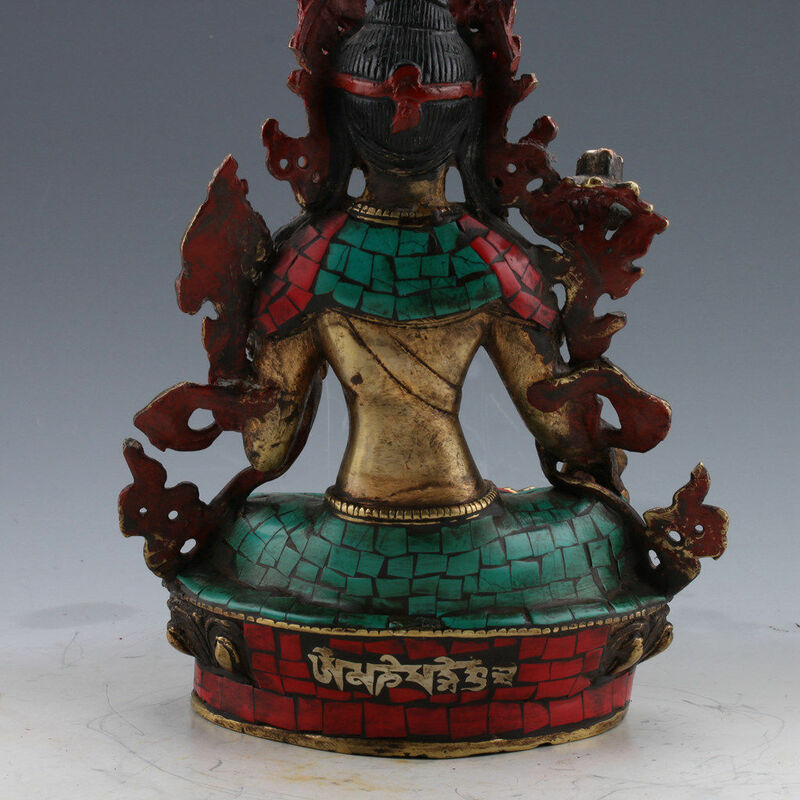 Really there should be a moratorium on all museum acquisitions of Chinese and Tibetan shrines until we can actually talk to the Tibetans and see if they personally as a group would like to sell such things in quantity at such low costs and how much of the money they actually see from it. Particularly if one believes in what these shrines represent, having compassion for the previous owners of such should be paramount, instead of just enabling genocidal maniacs bent upon cultural annihilation. But I guess if no more Tibetan religious statues are ever made then the value of what people buy from the Chinese goes up exponentially- this is great for investment values and people buying shrines now to have the Tibetans wiped off the face of the planet and their entire culture and religious belief system utterly destroyed. Then they make all the more money in the end because it will only add to the rarity of what they’ve purchased from Chinese communists. 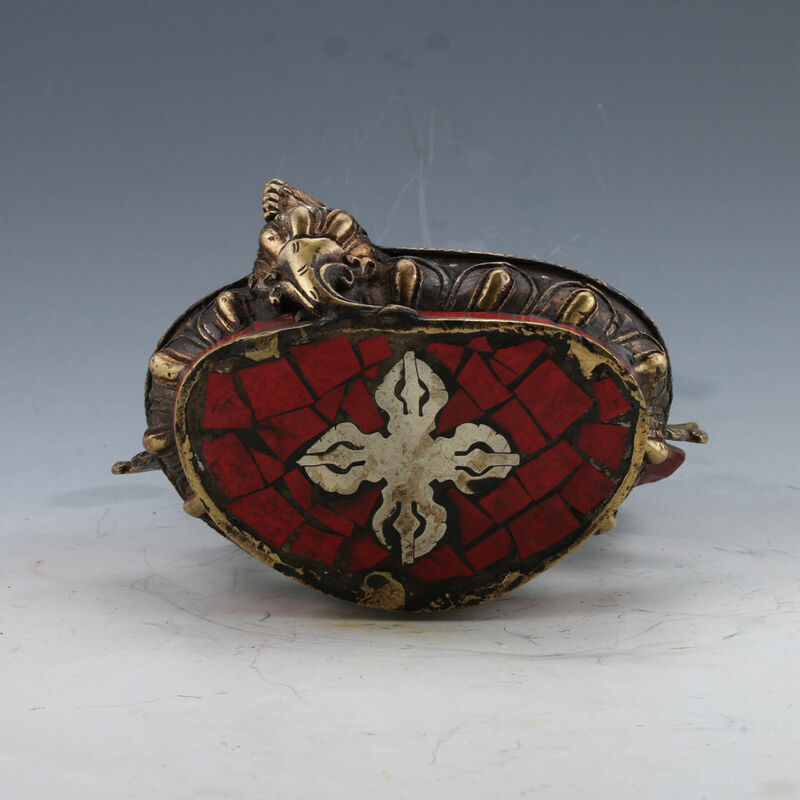 I wonder who is buying all the shrines if white people typically aren’t interested in Chinese antiques (what these Tibetan items are often labeled as and quite often closely resemble)? Sure could be that a lot of Chinese outside of the mainland now have had shipped to them- free of taxes or tariffs- any number of priceless antiques from their country that are only likely to increase in value. 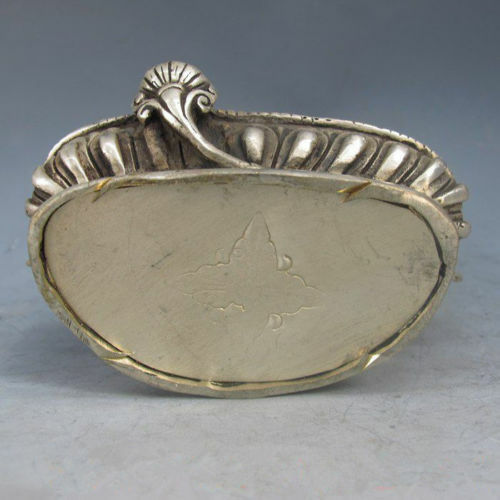 Quite a nice “present” from the homeland, the motherland- and if you want to make millions and keep buying priceless antiques for a pittance, you keep your mouth shut about it, and only talk of all the “fakes” you see for sale by the Chinese- if anything. This thangka- a Buddhist religious poster of a deity- specifically of Green Tara is hand painted using gold. An even more ornate one is featured below. This particular thangka seller in Australia changed shop names 4 different times within a year (in 2016) and closed its previous aliases when I questioned them about where these paintings came from. They told me they were all from Nepal of course at the time, but then sold the same thangkas as Tibetan before and after. As you can see from these thangkas for sale on the open market- taken from Tibetans- are quite valuable and maybe worth as much as a Tibetan family might make in an entire year, yet they see not a penny of the proceeds from the robbery of their entire nation for several decades at the hands of the Chinese.